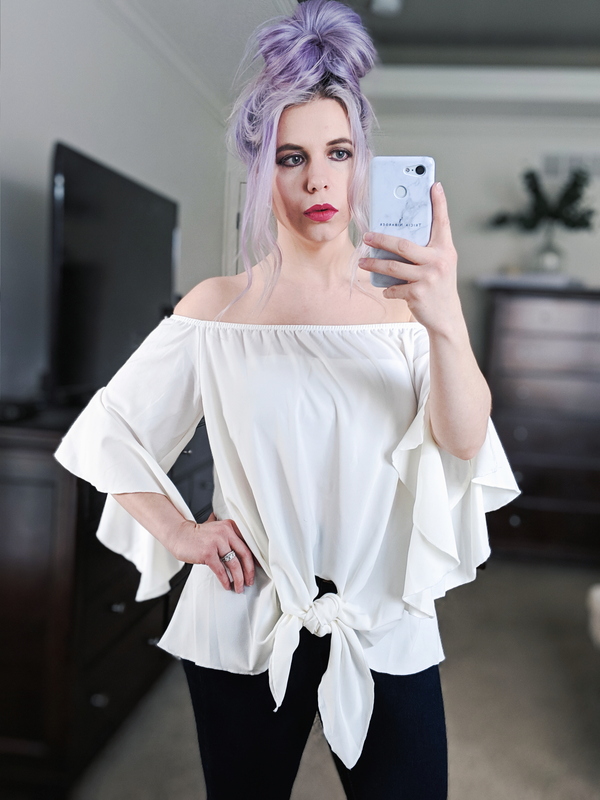 This off-the-shoulder blouse is so flattering! 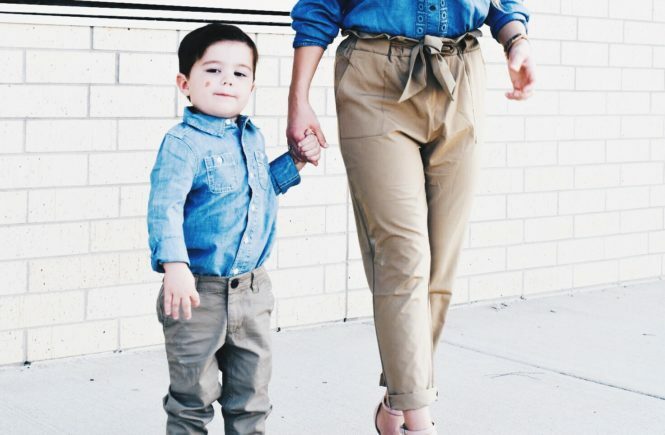 There’s plenty of elastic to keep it up on your shoulders, and the tie-front adds such a fun detail. Fit is true-to-size. I actually sized up one for a flowy look but ended up with too much excess fabric, so I recommend taking your normal size. Available in tons of colors and prints and super affordable! 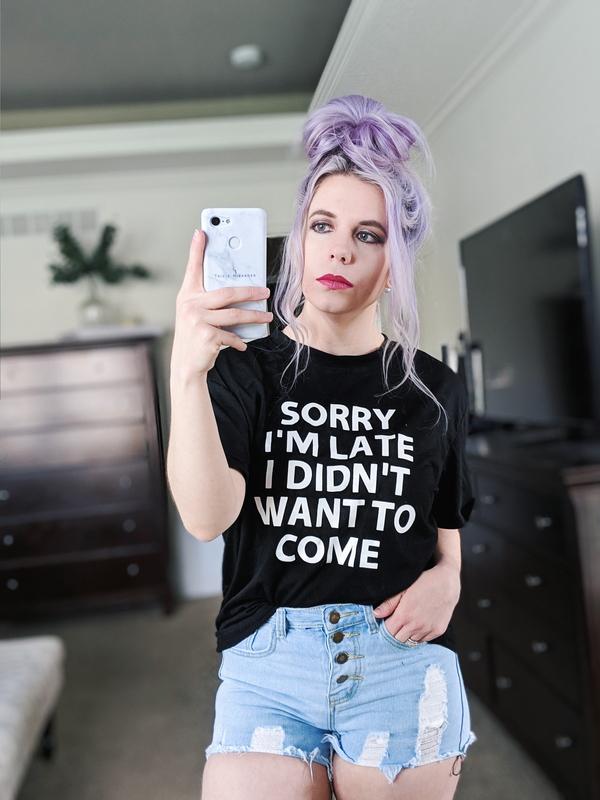 This shirt reminded me of something Phoebe would say on Friends. Note that it’s advertised as a crop t-shirt on Amazon, but it’s really not. It’s longer in the back than in the front [making it a good choice for pairing with leggings! ], but the front is normal length. The sleeves hit closer to my elbow, which is flattering. I sized up one in this but could’ve worn my normal size, too. 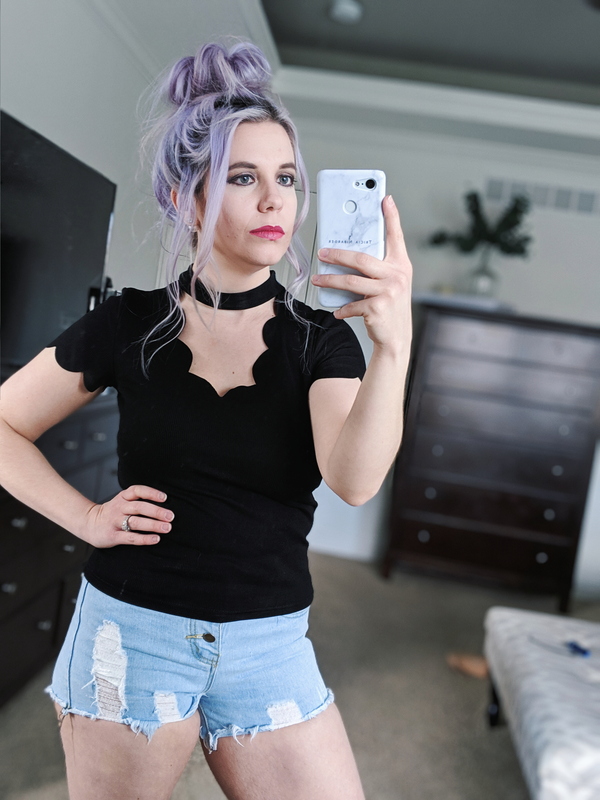 I really like the distressing on these denim shorts, but the fit was not very flattering. They hit my thigh in a strange place and the fabric bunched awkwardly around my stomach, creating a generally unflattering look. They would look much better on someone who is taller, and tall girls would probably appreciate the longer length as well. The scallop design on this shirt is so cute! I especially think it adds a fun touch to the sleeves. The material is ribbed, so it feels a little nicer than your average t-shirt. I recommend sizing up 1-2 sizes–I’m wearing my normal size here and the length is a bit shorter than I’d like [and I’m only 5’1″]. This scallop detail shirt comes in multiple colors and is very affordable, making it an easy addition to your closet. 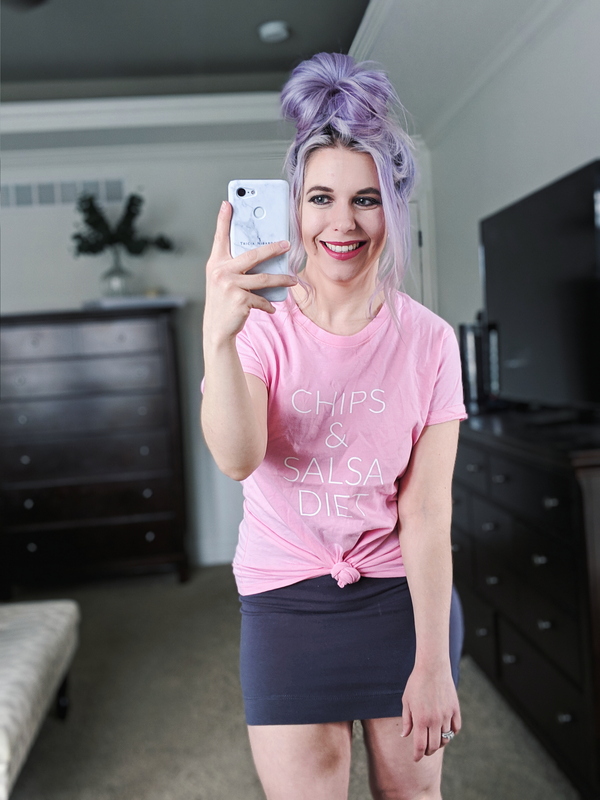 How perfect is this “chips and salsa diet” shirt for Cinco De Mayo? 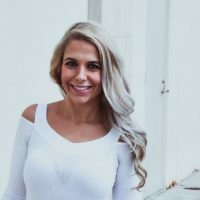 This seller makes the shirts to order, so you can customize shirt color and fit. I’m wearing the women’s fit in one size up from my normal size here, because I wanted the length for knotting. Although the listing says to allow extra time since the shirt is made to order, it actually arrived right on time with the rest of my Prime orders. This stretchy mini skirt is a find from another Amazon try-on haul long ago. It’s so comfortable–basically like the mini skirt version of wearing leggings. I wear it in the spring/summer with bare legs and in the winter with tights and boots [like here]. Comes in tons of colors and the price point is low enough to grab several! Normally I find peplum tops to be unflattering, but I really love this one. It’s actually the first peplum top I’m adding to my closet! Every other one I’ve ever tried on has been a return, haha. The fabric and fit are both great. The straps are adjustable, making it a great option for petites. They also criss-cross in the back, which is a cute detail. Plus, the scallop design is so good! If you have a smaller chest, this would even be a great option for work with a blazer. 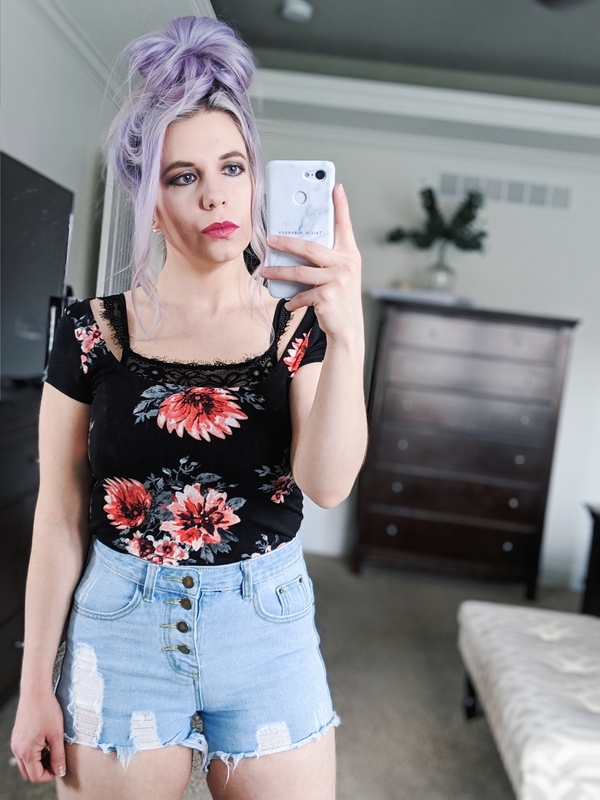 The material on this black floral t-shirt is very stretchy, so you can wear the cap sleeves up or push them down on your arms for an off-the-shoulder look. I recommend sizing up 1-2 sizes in this top if you plan on wearing it tucked in, as there is not a lot of extra length. I love the feminine floral design, though! My black lace bralette isn’t an Amazon find, but it’s super affordable and my most-reached-for undergarment as of late. 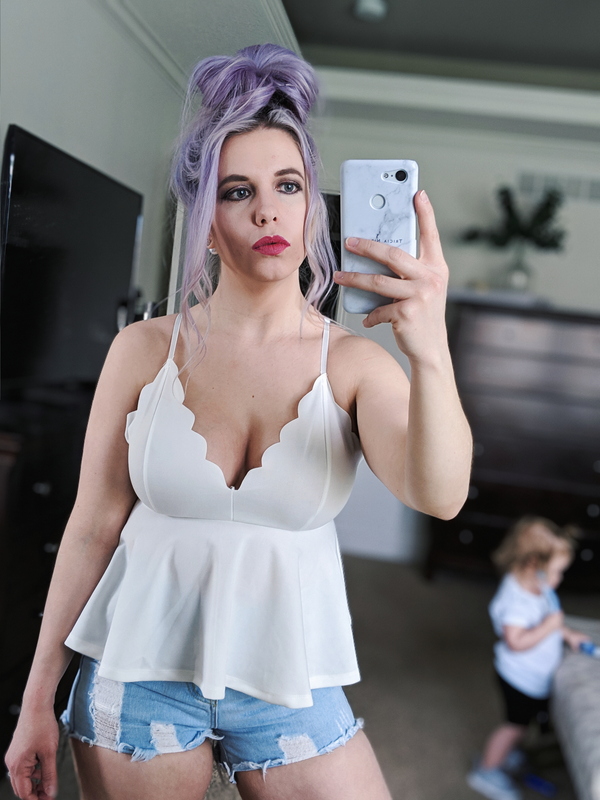 It’s more of a sports bra like design as opposed to separate cups, making it a more flattering option for those who need legitimate support in their bralettes. And the detailing looks so cute peeking out under a low-cut tee or tank top. These black drawstring shorts with white piping are so flattering! The waistband doesn’t have much elastic, so the shorts rely on the drawstring to keep them up. This means you can tie the drawstring as tight or loose as you want–meaning no unwanted muffin top. They also come with a free bandeau bralette! One caveat–these shorts are more for style, not actual workouts. If you want a similar pair that is better suited for athletic activity, try these. They have more elastic and will stay in place better during workouts. The white v-neck t-shirt I’m wearing is an NSALE find that goes in and out of stock periodically, but I showed a similar Amazon option above. 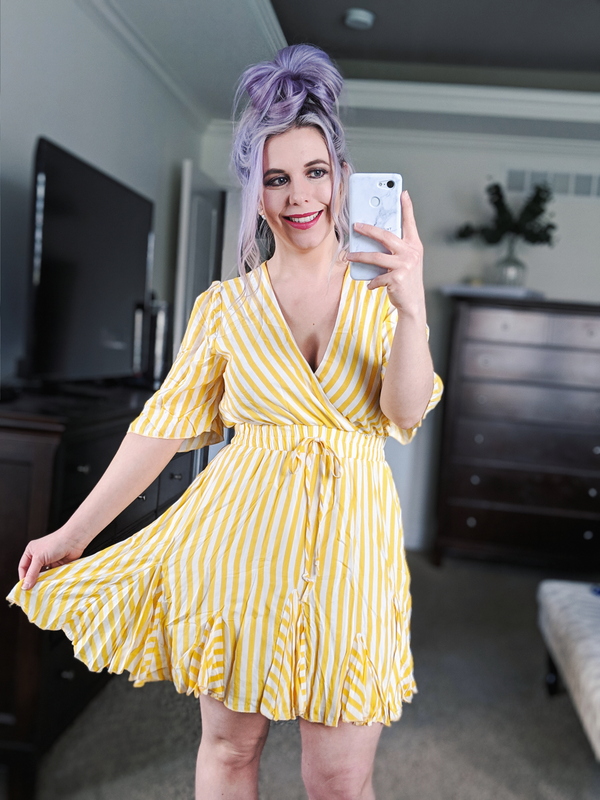 The ruffles and tie-front on this yellow striped dress [also available in other colors] are so cute! I also like the flattering sleeve length. What I don’t like, however, is the amount of extra fabric on the top of the dress, making it sag awkwardly in the chest area. 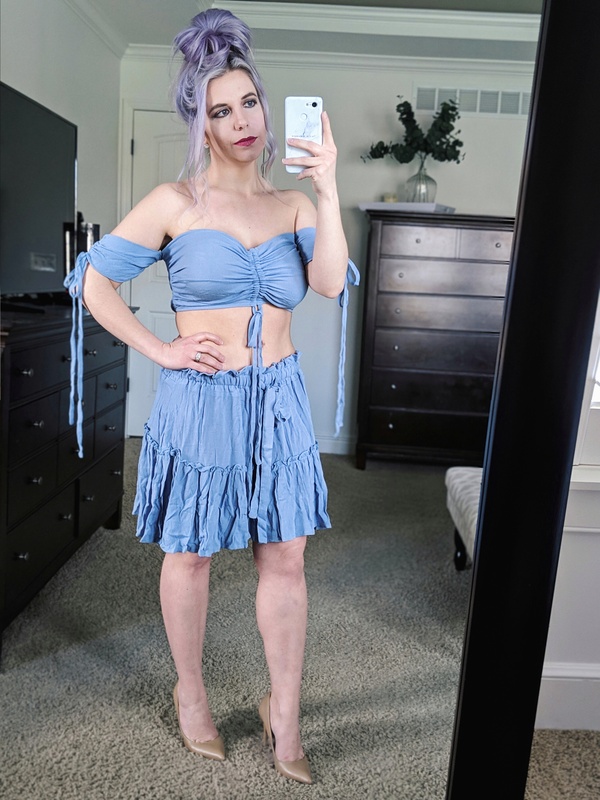 For me to wear this, I’d have to get it professionally altered, defeating the main purpose of my Amazon try-on hauls [finding cute clothes at an affordable price point!]. The quality of this dress was really nice, so I do recommend it for those of you who are average height. The hemline would probably be too short for comfort on taller ladies. If you have somewhere to wear this two piece skirt set, buy it. Seriously, it is so cute and surprisingly flattering. You can adjust the length of the shirt and sleeves with the ties, plus the waistband on the skirt is super stretchy, so no muffin top. 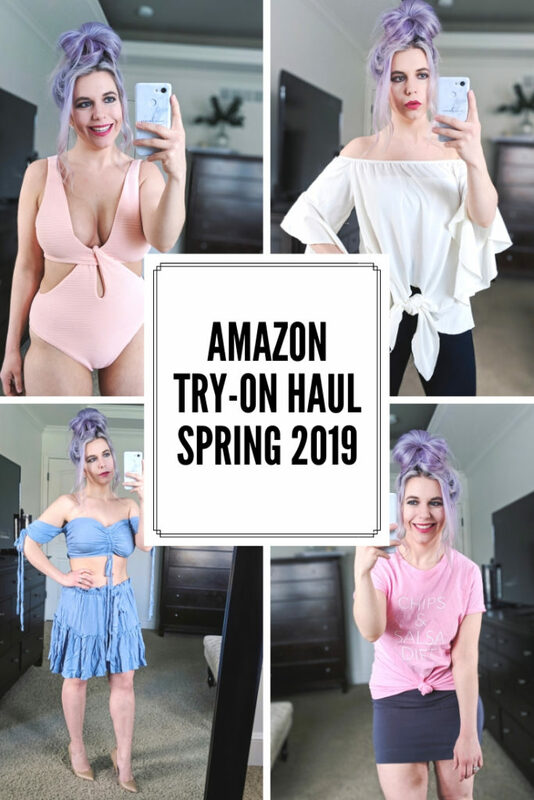 I only have one swimsuit in this Amazon Try-On Haul April 2019 because I just did a huge Amazon swimwear try-on haul recently. 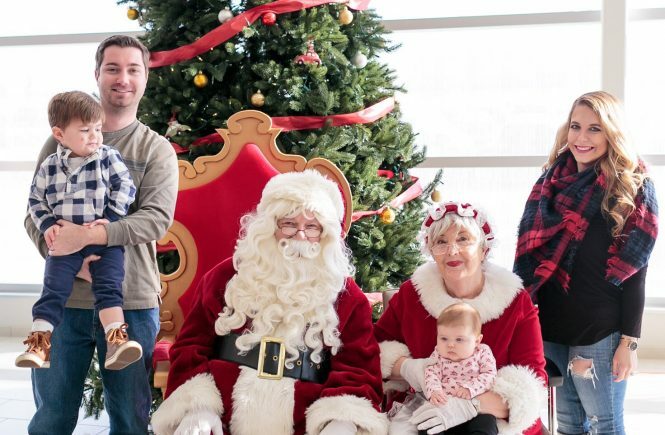 But this one caught my eye so I had to add to cart–and I’m so glad I did! It’s such a unique design. The legs are high-cut, which helps elongate short legs like mine. This suit camouflages problem areas while still being flirty and showing some skin. Definite winner! I also do video try-ons on a regular basis in my Instagram Stories. 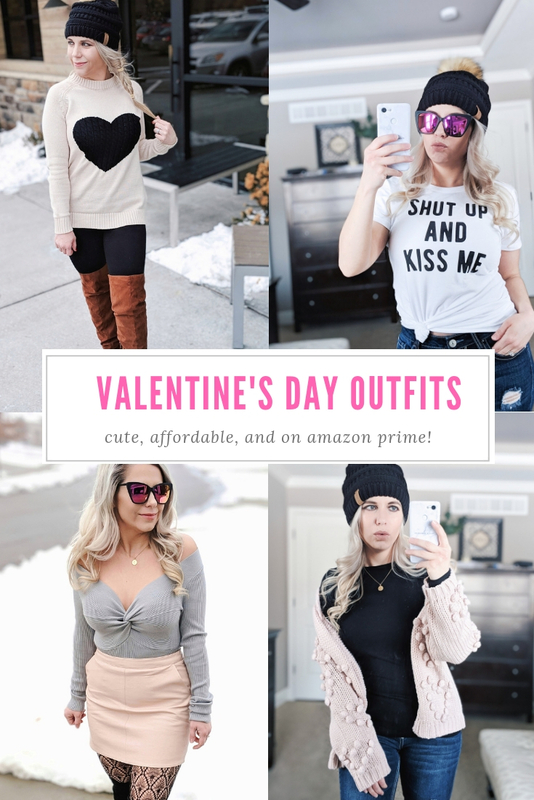 You can see video footage and reviews of the items in this post as an Instagram Story highlight on my profile–just look for Amazon April 2019! 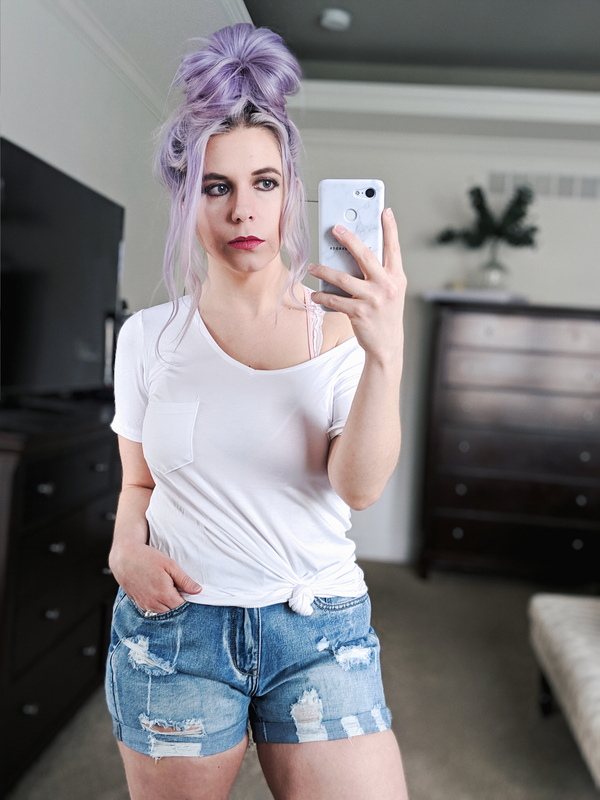 Pin this Amazon Try-On Haul Spring 2019 for later!